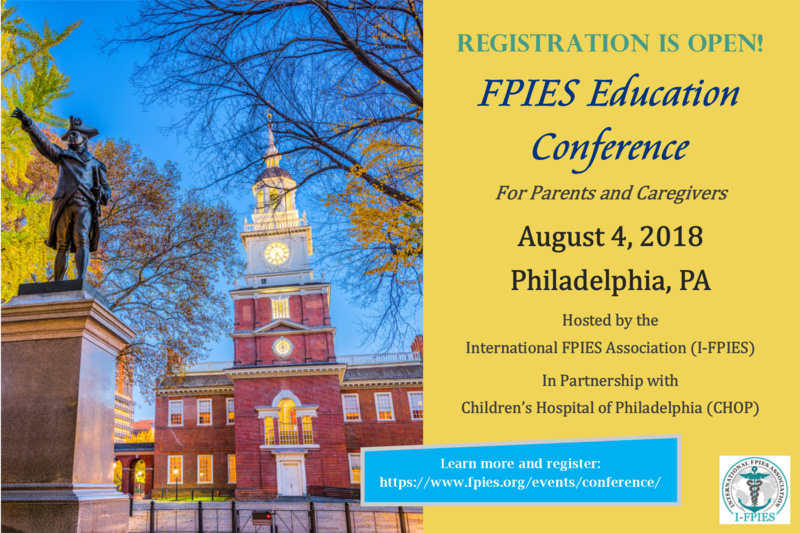 The International FPIES Association (I-FPIES) is now accepting applications for two travel grants of $500 for parents interested in attending our 2018 FPIES Education Conference in Philadelphia, PA on August 4th. 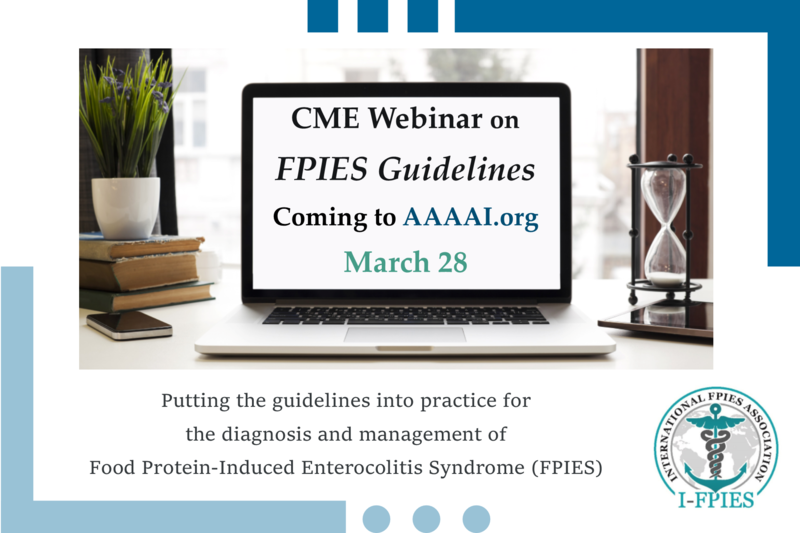 I-FPIES is hosting this conference for parents and caregivers affected by Food Protein-Induced Enterocolitis Syndrome (FPIES), a non-IgE form of food allergy that impacts the gastrointestinal system. The FPIES Education Conference is a one-day event that will bring together leading researchers, patient care experts, nutritionists, and other leaders in the field, all of whom volunteer their time to help educate families living with FPIES. Our travel grant program seeks to encourage and support families in need to attend our FPIES Education Conference. I-FPIES will distribute two $500 awards to eligible applicants. The award is to be applied to all directly related expenses, including hotel, transportation, mileage, and meal costs. The travel grant recipient will also have conference registration fees waived for immediate family members. Upon notification of grant award, instructions on how to register utilizing waived fees will be provided. If family has already registered, the registration fees will be refunded. During the conference, the grantee is asked to participate in I-FPIES-related activities, including photography and social media promotion. After attending the conference, the grantee is also asked to share what they learned with the FPIES community. Applicant’s child(ren) must be diagnosed with FPIES. Annual family income for the $500 award should not exceed $80,000 per year. Applicant must be a U.S. resident over 18 years of age. Applicant cannot have attended an FPIES Education Conference in the past. First-time attendees only. Please also include the following information with your submission: your name, name(s) and age(s) of family member(s) diagnosed with FPIES, geographic location, annual household income, and contact information to reach you. Deadline for entry is Tuesday, June 26 at 11:59 p.m. ET. The grant recipients will be selected by members of the I-FPIES Executive Board and announced via email and social media on Friday, June 29. No money can be awarded in advance of the conference. Grantee must submit the original receipts for reimbursement. Requests for expense reimbursement may be made at the conference and up to 30 days after the conference ends. Any requests for reimbursement that are received by I-FPIES more than 30 days following conference conclusion will not be considered. If you have any questions about the travel grant program, please email us at contact@fpies.org. For more details about the 2018 FPIES Education Conference, visit our main conference page. New FPIES Education Opportunity for Medical Providers! Previous Previous post: Registration Is Open for 2018 FPIES Education Conference!